Te Kainga Marire - Maori for the peaceful encampment - is a skilfully designed inner-city native garden that mimics - and even improves - New Zealand's natural environment. 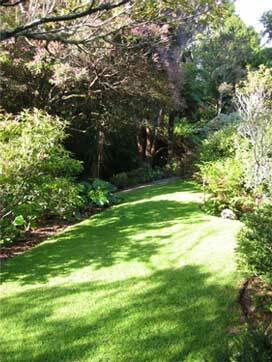 Situated in a once weedy New Plymouth valley, Te Kainga Marire is now considered to be one of few private gardens of international significance by the prestigious RNZIH New Zealand Gardens Trust. The garden wraps around the Poletti-Clarkson family home, snuggles up to a coastal swamp forest remnant and pa site and spills on to the neighbouring river reserve and Te Henui walkway leading to the city and sea. This is a harmonious garden that weaves subtle textures and colours with quirky forms. Lush ferns, wetland plants, alpine treasures and native trees here make up a microcosm of the New Zealand landscape - a gem of Middle Earth.